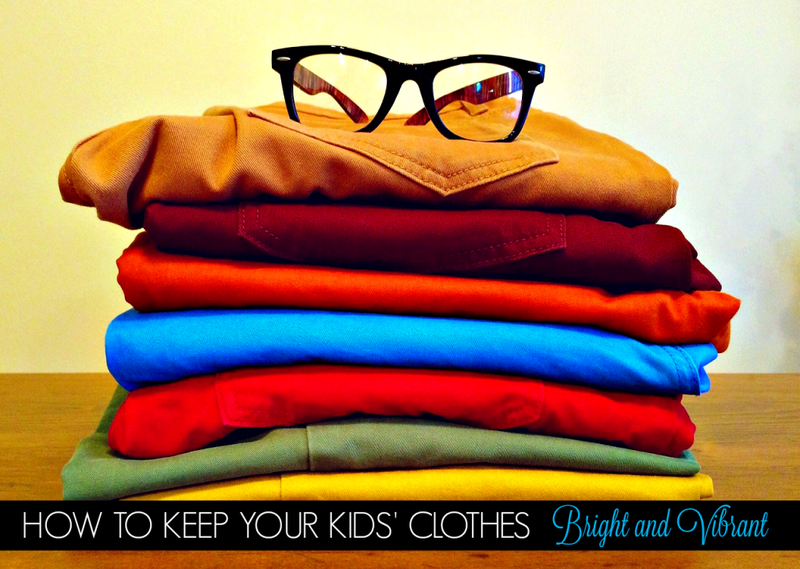 How to Keep Your Kids’ Clothes Bright and Vibrant! Pass down the best hand me downs! I think that it is safe to say that it’s starting to feel warmer and the sun is starting to set a bit later. Spring has officially sprung! It was a long winter, the kids wore tons of layers and somehow, they’ve sprouted and they’ve grown so much. I’m sure yours are the same but before you head out and by them new threads, consider hand-me-downs that are a great cost-effective way to easily turn-over your kids’ wardrobes. Passing down your kids’ old clothes that are in great shape is a great way to save some cash and to me, they are nostalgic. I love seeing Mimi wearing clothes that Gabby wore and she has tons! The reason I am able to get two generations in them is by taking care of them regularly. Here are some simple and affordable ways to keep your kid’s clothes in great condition and hand-me-down ready! Gather all your friends and have a clothes swap. Everybody can bring their kid’s old clothes that they have either outgrown or are simply tired of. It gives you and your friends the chance to catch-up and socialize while refreshing your kids wardrobe and saving money. Bonus: gather your friends who wear the same size as you do for a clothes swap of your own! Sometimes it feels easier to just get rid of a garment when it gets a bad stain. But, you can always get on it right away and treat it according to the material and get the stain out before it sets. I know I’ve used OxiClean to get rid of pesky stains, I’d make a paste and it works like magic. Maybe you have a clothesline outside or within your laundry room like me but, it’s always great to wash your clothes as you normally do and hang them dry. It saves them from a trip through the dryer and keeps them looking like new. Plus, it saves energy! I have always washed all of our clothes with cold water. I know! Crazy! But, it really isn’t. The only time I use hot water is for washing Gabby’s soccer uniform after a muddy day. Hot water wears out clothes faster. I use OxiClean Coldwater detergent packs and I’m good to go, our clothes is just as clean, vibrant and the threads stay strong! Fun, bright and colourful spring clothes can lose their vibrancy quickly during the year – making it hard to pass them on. The right laundry detergent can go a long way in caring for clothes. It will ensure your whites stay radiant and your colours vibrant. Upgrade from ordinary detergents and give your kids clothes a high definition clean with OxiClean™ HD™ Laundry Detergent (available in liquid and paks). At the end of every season, have your kids help you pack away any clothes that are getting too small for them. For Mimi, I have to try them on her because I just never know. For Gabby, it’s always been easier. Next, have them label the box with the date and season so in a few years, when your next child is ready for a new outfit, you know exactly where to find them. Whatever doesn’t make it into storage, I usually pack away in donation boxes or sell them for consignment. Since we take care of our clothes, we can always make good credit and purchase other hand me downs. To keep the clothes fresh for when you need it, make sure to wash everything before you store it away. Use OxiClean™ Foam Pre-treat to rid your children’s clothes of tough dried on stains – even grease! When your next child needs it, it will be bright, vibrant and stain-free! Do you have any great tips for re-using old clothes and saving money? I wouldn't have any wearable clothes without oxiclean! I can't eat a meal without dropping it on my shirt. Haha, I am pretty bad too! I really need to listen to what you have in here. I am terrible with laundry I just throw it all in one load. My clothes are definitely much more faded in my whites are not whites more. Thanks for the tips,as soon as the weather warms i will be using my clothes line there nothing nicer than fresh sheets from the line. I also wash our clothes in cold water, it really does help keep the colors in longer. These are such great tips. My middle child is the queen of stains and spills I have to remember to treat hers right away or she would need new clothes on a weekly basis! Yes, you do not want them to set! I just got both of my daughters some adorable brightly colored clothes for spring and summer. I'll have to try these tips – thank you! I always make sure to sort our laundry out!! It is amazing how fast you can wear out your clothes color. I totally agree that airdrying and using cold water helps when it comes to keeping your clothes in tip-top shape. I've been meaning to do a clothes swap for ages but have been putting it off. It's about time I go through with it! Taking part in a clothing swap is a great idea. I’ve given and received kids clothes this way. It is a great way to get good use out of good clothes! What great tips. Most of the time, people want to wash in hot water because of fear of germs and bacteria. This is an ideal way to keep the clothes looking great. I wish more people would air-dry too. I love to keep our clothes bright like this. This post has a lot of great info. I never really thought about using cold water. I'll have to start doing that again. I normally use warm water when washing clothes. We use only cold water and love it! I always use cold water for my laundry. I will have to host a clothing swap. it is a great way to get some new clothes for the kids. Cold water for us all the way! A clothing swap is a great idea. I have so many friends with kids i do not know why we never thought of it before. Thanks for the great tips. We have been using OxiClean for years — since the day it came out. We have been a long time fan of it and it definitely does what it says it does! I air dry my own for this very reason. Smart to do it for the kids as well, especially on special garments. These are great tips! Especially the cold water wash. I can't get it through my mom's head that cold washing adds life to clothes. Hehe, we do it all the time and it works! Big fans of Oxiclean here! I find turning certain items inside out help keep them looking their best too! I love Oxiclean! It keeps our clothes clean and bright. Especially when we get stains! I declutter our kids clothes each season and I am always amazed at how fast they have grow!! Thanks for the tips. I am not a fan of putting laundry away! Even my sister and Mom has changes since they seen the difference in my clothes. That is awesome. I am glad it has helped you!